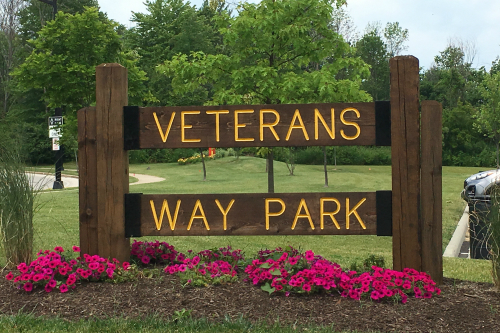 Veterans Way Park is tucked back behind the charming and historic town of Hudson, Ohio. Veterans Way road leads down to a 38-acre park with activities lining both sides of the street. On one side there is a playground, pavilion, sand volleyball court, access to the walking trail/wetlands and restrooms. Just across the street, on the other side, you’ll find Hudson’s own skate park, basketball courts and access to the hiking trail. This park truly meets the needs of every age group! A large parking lot provides ample space for playground parking, as well as for loading and unloading vehicles. A sand volleyball court and pavilion are located right off of the parking lot for additional space and play. There is one mile of trail, including a wetlands area, which is accessible from the parking lot. Also, the train tracks are just beyond the walking trail, so you might spot a train on your visit, which is always a hit for our little boy. The playground is housed in a large, mulch covered area, with several different play sets. A smaller play set is aimed to keep younger kids busy, while a larger set allows the older ones to challenge themselves on a rock wall and larger slides. Musical instruments, interactive games and even a tree-themed climbing set add a little something extra to this playground. The swings include regular swings, accessible swings and baby swings. 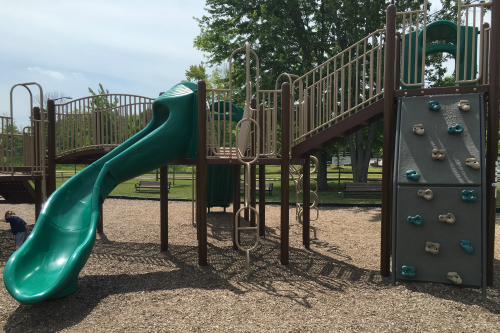 The playground is surrounded by a grassy area, trees and several benches, which serve as a great spot for snacks. The bathroom and water fountain are conveniently located right off the playground area as well. Across the street the Hudson skate park offers a perfect spot for avid skate fans with a variety of ramps, rails and jumps. Additional parking is available for skaters, as well as those interested in accessing the trail from the other side. Just a block up the street is another, smaller parking lot, as well as the basketball courts. 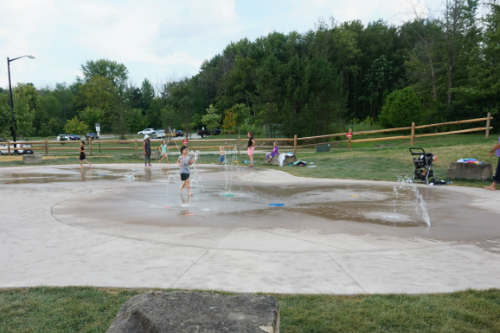 Veterans Way Park has a new summertime addition: a splash pad! The Hudson park water feature is set within the parking lot of Veterans Way Park, near the volleyball court. There is a fence blocking the splash pad from the street and access directly from the parking lot. Fountains of all shapes and sizes squirt up directly from the ground for children to jump in and through. 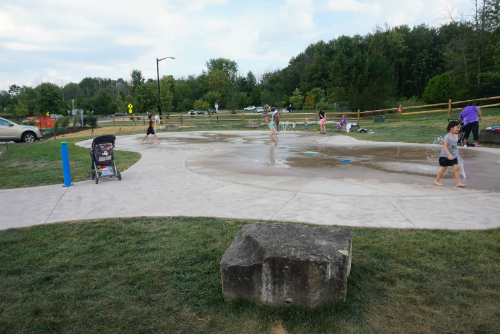 There are several large stones set around the park that provide seating for those not splashing. Bathrooms and the Veterans Way playground are just steps away. 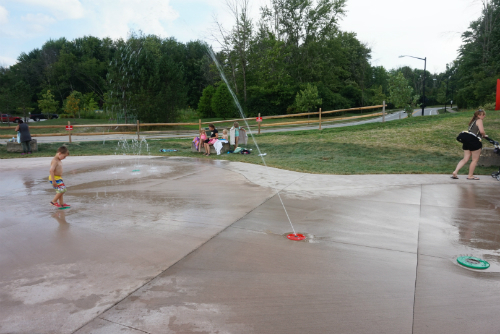 These new kid-friendly fountains are the perfect way to beat the summer heat! 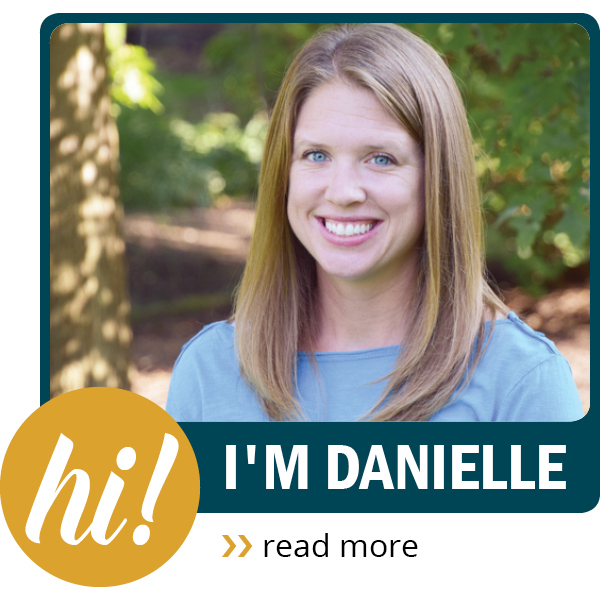 A few tips for your visit: bring plenty of sunscreen (the splash pad is all open to sunlight), rubber-soled shoes are recommended, bring a towel and check out the website’s rules before visiting. If you are visiting the splash pad, bring plenty of sunscreen because it is all open to sunlight. 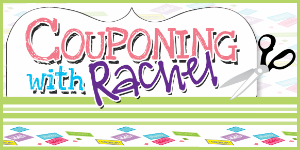 In addition, rubber-soled shoes are recommended and remember to bring a towel. 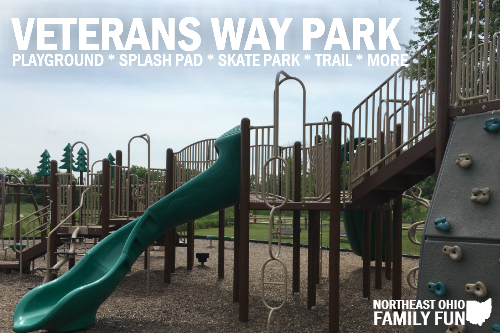 Veterans Way Park is a great spot to keep the entire family entertained. Whether you’re looking to play, walk or skate, this park makes it possible. Next time you’re downtown Hudson, be sure to stop over and check out the variety of activities.